Your dentist may offer a partial denture as a treatment option if you need to replace teeth in any area of your mouth. Partial dentures can be fitted to accommodate the back or front of either the upper or lower arch. Treatment is convenient and effective at restoring your smile and your ability to speak and chew comfortably. A partial denture is a fixture that looks like natural teeth and gums. Artificial teeth are affixed to a plastic base that is shaded to match your natural gum color. The fixture may have a metal framework or acrylic framework. This type of denture is a common option when one or more natural teeth remain in the area for support. In contrast to full dentures, partial dentures can be placed around teeth that are still in place instead of replacing the entire set of teeth. The difference between partial dentures and complete dentures is the number of teeth that need to be replaced. Both types of denture are made in a lab from impressions of your mouth. A partial denture is seated over the gums but is also secured to teeth on one or both sides of a gap. A full denture sits on the gums and is held securely by natural suction. However, due to changes in the shape of the bony structure and the gums, a complete denture may require extra stabilization from denture adhesive or dental implants. What do Partial Dentures fix? The primary problem that is addressed by a partial denture is missing teeth. The installation of a partial affixed or removable denture closes the space between remaining teeth. In so doing, the presence of the partial denture also corrects problems like shifting, debris accumulation in the gap, and progressive dental disease. With a partial denture, you can feel good about your smile, eat the foods you like, and speak with confidence and clarity. Who is a candidate for partial dentures? Partial dentures may be a good treatment option for many people. This method of tooth replacement can give you back your smile in a cost-effective manner and without lengthy healing time (which is needed for dental implants). Partial dentures provide a relatively fast solution for tooth loss or disease and treatment does not require healthy teeth to be altered to accommodate a long-term restoration like a dental bridge. Metal framework partial dentures attach to natural teeth with discreet metal clasps. The clasps provide a degree of stability to the replacement teeth, but patients should expect slight movement when chewing and possibly when speaking. This may depend on the location of the partial denture in the mouth. Acrylic removable partial dentures are almost entirely acrylic, including artificial teeth and the “gum” portion of the fixture. This denture is held in place with wire clasps that secure the denture to natural teeth. The various types of partial dentures have certain advantages and disadvantages. The details of each can be discussed during your consultation and recommended based on your long-term needs. Tooth replacement with a partial denture is a careful process that begins with a comprehensive dental exam and consultation. 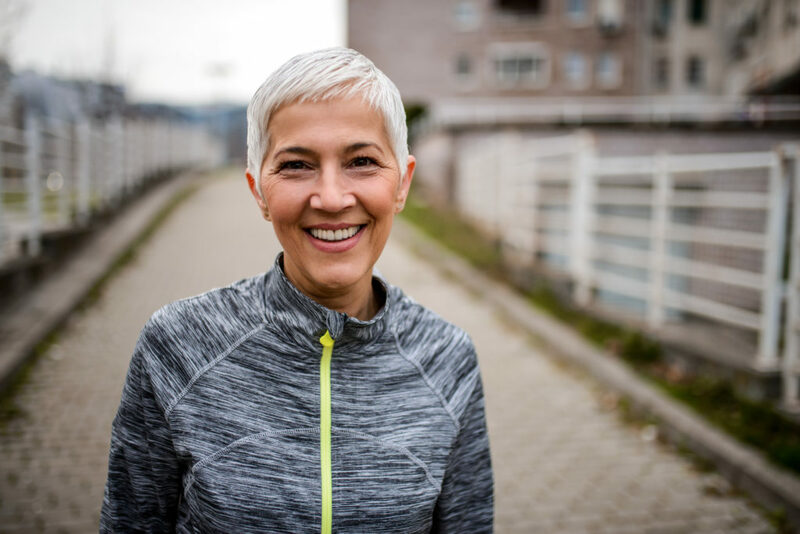 It is our intent to make sure you are pleased with your choice of treatment, so we take time answering questions and explaining the details of getting and living with a removable partial denture. The entire process can take two or more visits. 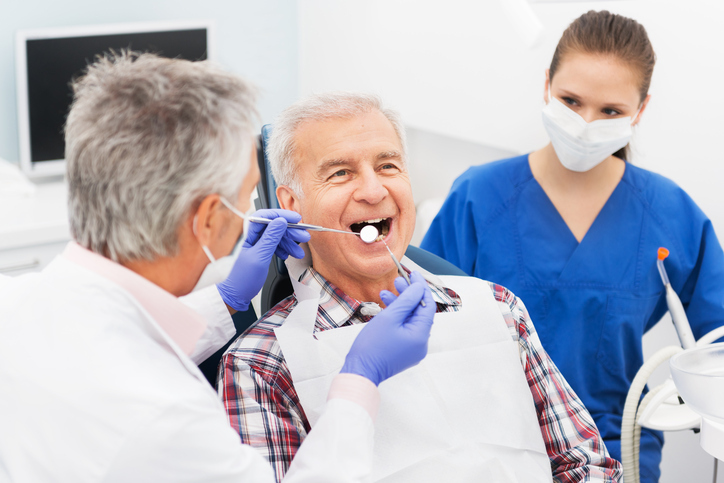 To begin the preparation for new dentures, we take necessary impressions and measurements of your teeth and gums. This enables us to ensure that your artificial teeth are the right size in relation to opposing teeth, adjacent teeth, and the height of your arch. 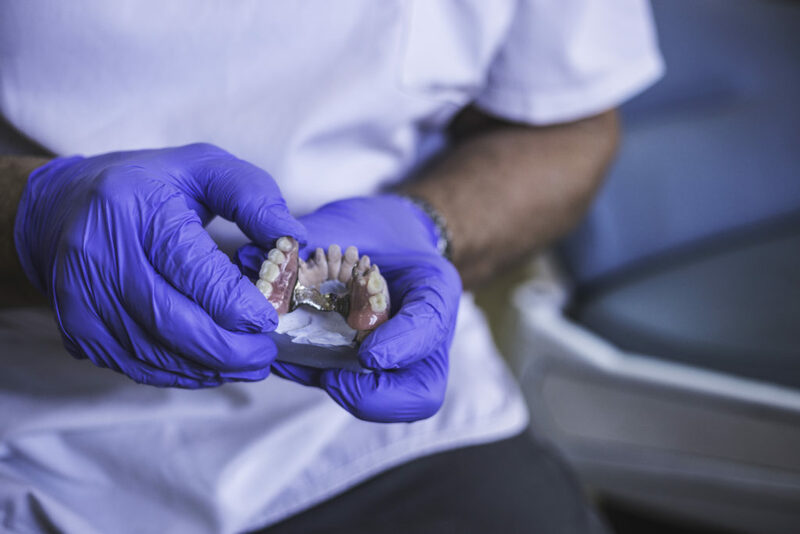 The information obtained through imaging, impressions, and measurements is sent to a dental lab, where dentures are fabricated to our specifications. This includes the color of the gum portion of the denture and the shade and shape of artificial teeth. A fitting may be scheduled a few weeks after the initial visit. At this time, we assess the denture for proper fit and stability. If necessary, minor adjustments can be made during this visit. When we have achieved the desired fit, you are ready to resume your daily life with a great new smile. Always handle dentures with extreme care. Before cleaning, lay a towel over the sink so dentures do not break or chip if they get dropped. After eating, rinse the mouth with water to remove debris from around the fixture. If your partial is easily removable, take it out and carefully rinse it under warm water. Brush the denture with a soft toothbrush and nonabrasive toothpaste before going to bed and in the morning before inserting the fixture. If approved by your dentist, you may choose to soak your denture in cleaning tablets overnight. This may inhibit plaque buildup and staining. If you soak your dentures, rinse them thoroughly before inserting into the mouth. Store acrylic dentures in water to prevent them from drying out. See your dentist periodically to evaluate the fit and overall condition of your partial denture. If a sore spot occurs, schedule a dental checkup. An adjustment may be needed to improve the fit of your denture. With good care, a quality denture can last up to eight years. As materials and techniques have improved, the lifespan of the average denture has expanded. We provide the education and support you need to maximize the use of your new denture. If you are concerned about a missing tooth or teeth and want to prevent future problems related to the empty space in your mouth, contact us. Call 212.758.9690 to schedule a consultation with Dr. Roberts or Dr. Sirota. Prosthodontics of New York serves Manhattan, NYC and surrounding areas.